FORESIGHT, innovation and endurance are just some of the words used to describe why Peter and Frances Bender are the Kondinin Group and ABC Rural 2018 Australian Farmers of the Year. Frances and Peter Bender from Tasmania are the Kondinin Group ABC Rural Farmers of the Year. 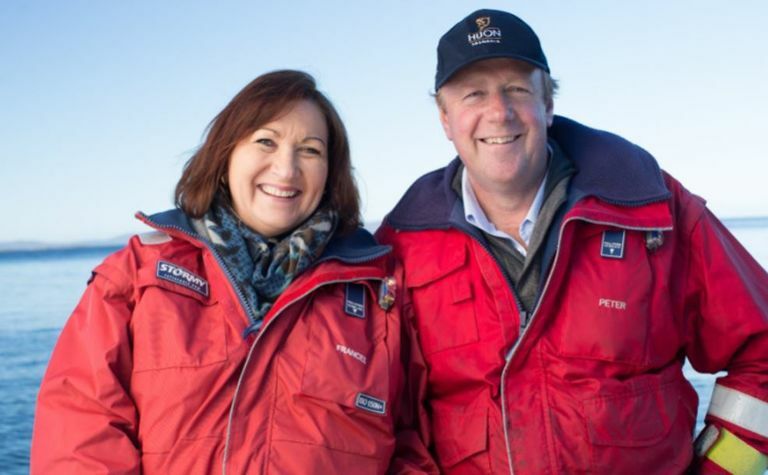 Peter and Frances are the founders of Huon Aquaculture Company; recognised internationally as being an industry leader and innovative producer of premium quality salmonid products. While their company may now boast a staff of 605 and an annual turnover of $318 million, Peter Bender recalls how their introduction into aquaculture was a humble one. "I come from a land-based farming family who traditionally managed cattle and sheep," Peter said. "It was in the late 80's that Frances and I decided to diversify into salmon and trout farming on the Huon River and in 1986 we created Huon Aquaculture Company." 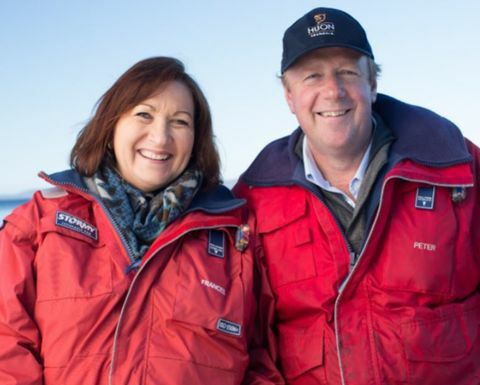 "It was a real leap-of-faith getting into fish farming at that time and a huge financial challenge, but I think it was because of that beginning, our previous farming knowledge and the values that Frances and I have, that has led us to the successful position we are in now." Under the Huon brand, Peter and Frances farm six million fish producing 25,000 tonnes of product annually. They have an extensive product range including fresh salmon, cold and hot-smoked salmon, pate and salmon caviar. Peter and Frances have also made a large impact with their employment strategies and in 2015 Huon was recognised by the Tasmanian Government as an Employer of Choice. "We have a mix of highly experienced staff and tertiary graduates, and we encourage our staff to further their knowledge and skills by completing additional Certificate courses," Frances said. "We have support programs for staff requiring assistance with language, literacy, numeracy and digital literacy and we have a significant workplace and community suicide prevention program in place." "It is really important to us that we support our local community and we have done that through setting up a trust and providing grants for worthy projects. It is our way of giving back to those who continue to support our business and farming dream." The Benders are acknowledged by many as being hands-on managers of the business, getting involved in every facet along their production line. "Some people think we are just fisherman, but we aren't - we are farmers," Frances said. "We pride ourselves in producing and maintaining a healthy and viable animal stock and that means everything from using science and the latest breeding techniques, through to ensuring our equipment, pens and environment are the best they can be." Timothy Reid, a fellow Tasmanian farmer and 2013 Australian Farmer of the Year award recipient, said the Benders were true ambassadors for agriculture in Australia. Kondinin Group's Ben White said the Benders were a fantastic example of how, despite the diversity of the Australian agricultural industry, the characteristics of an outstanding farmer remain the same. "Successful farmers are those who think innovatively about their enterprise and when faced with a challenge meet it head on," Ben said. "The Benders have demonstrated their farming excellence through their ability to operate a thriving and dynamic farming enterprise; built on a thorough understanding of their stock, their sector, their staff and their region."